We live in an era of constant connection. Between our desktop computers, laptops, tablets, smartphones and gadgets like smart watches, there is rarely a moment that we are not plugged into our work, social lives and online communities. While there is a lot to be said for the wonderful advances that have transpired since the advent of portable tech, it’s also important to realise that the radical shift in lifestyle that came along with all these devices is having a substantial impact on our physiology. Case in point: the use of electronics before bedtime has been linked to a lessened ability to fall and remain asleep throughout the night. 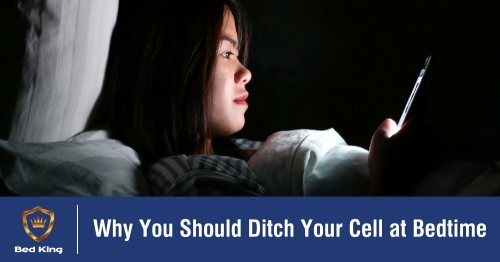 What follows is a concise explanation of how electronics impact our circadian rhythm or sleep/wake cycle, and why you should considering limiting your screen time in the lead-up to bedtime if you want enjoy a restorative night’s rest. The blue light that is emitted by devices such as your phone, TV and tablet suppresses the release of melatonin in the body. This hormone is responsible for supporting the sleep/wake cycle that prompts your body to relax, unwind and fall asleep when the sun goes down; and to become more alert and wake up once the sun is up. Blue light is not the only culprit - the full light spectrum has been known to disrupt sleep - but it is the most intrusive by far. In fact, it has been determined that substantial screen time before bedtime on 5 consecutive nights can delay your body clock by as much as 90 minutes - prompting your brain to fall asleep later and sleep in longer. DID YOU KNOW? Blue light is so effective at keeping humans alert that businesses like 24-hour factories actually use it to help their night workers to stay awake throughout their shift. It is also used in dance clubs to keep partygoers active and energetic. There you have it - a concise look at the science of how electronics impact on your ability to fall and remain asleep throughout the night. Keep an eye on the blog in coming weeks and months as we share more expert advice on subjects like these. In the meantime, we would like to invite you to take part in our #SleepRevolution. Sign up for the Bed King Sleep Challenge to stand a chance to WIN up to R20 000 in prizes. Competition valid until 16 February 2019. Ts & Cs apply.